OFFICIAL AUTHORIZED STEVE KAUFMAN ARTWORK! EXTRAORDINARY STEVE KAUFMAN HOMAGE TO DALI LARGE HAND SIGNED LIMITED EDITION SCREENPRINT, This is a wonderful exciting SIGNED BY THE ARTIST LIMITED EDITION SCREENPRINT Created by Artist Steve Kaufman. Featured in several important published works on the artist. It is the RARE hard to find SIGNED Limited Edition features sophisticated brilliant color tones in this artwork, excellent! Made of the very Finest Archival Museum quality Excellent NEW MINT CONDITION is Highly desirable for collectors. Rare, hard to find piece. This item is subject to availability. This is a large Screenprint, perfect for any elegant home, office, restaurant or place of business. WE CARRY OVER 300 STEVE KAUFMAN Art works. Steve Kaufman is the former assistant of legendary pop artist Andy Warhol and Steve also known as aka SAK is now regarded as one of the most highly sought after and important pop artists of our time. After leaving the Warhol Studio, Kaufman embarked on establishing himself and his innovative vision and approach to art. He has refined the silk-screening process for greater self-expression. Kaufman's works are today in major collections including Andy Warhol Foundation, The White House, The Smithsonian, Van Gogh Musuem, Amsterdam Museum, Saatchi & Saatchi, Marilyn Monroe Estate and More. Kaufman is known for his exciting Warholesque art works, which include paintings, silk screens and Serigraphs. He is most known for his superb and striking celebrity paintings and works which include fabulous portraits of iconic celebrities including Marilyn Monroe, Princess Diana, Madonna, Lady Gaga, Picasso and Beethoven to Martin Luther King Jr. and President Clinton. His works are highly sought after. Kaufman aka SAK has received accolades and acclaim and has captured the attention of avid art collectors worldwide. His clients include the likes of Elizabeth Taylor, Calvin Klein, Mickey Mantle and many more. Not only is Kaufman a major creative force, he was also seriously involved in raising over $5 Million dollars, working with over 150 charities and dedicated to making a positive difference in the world. 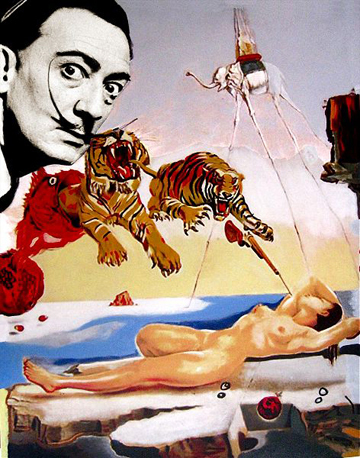 Click the button below to add the Extraordinary Steve Kaufman Homage To Dali to your wish list.